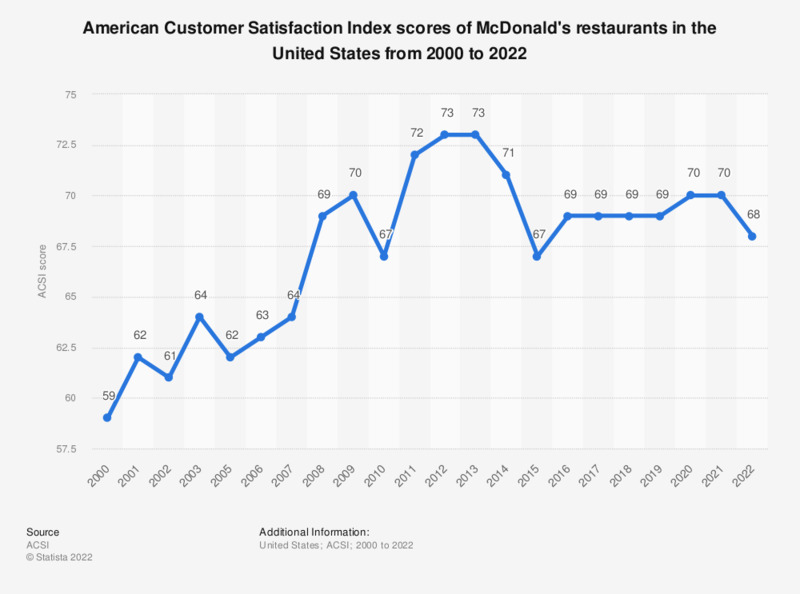 This statistic shows the American customer satisfaction index scores of McDonald's restaurants in the United States from 2000 to 2018. McDonald's ACSI score was 69 in 2018. The limited-service restaurant industry was not measured in 2004. McDonald’s, which is headquartered in Oak Brook, Illinois, is the world’s largest quick-service restaurant chain. The company is publicly traded and generated more than 22 billion U.S. dollars in revenue in its 2017 fiscal year. Almost two thirds of that revenue was generated through company-operated restaurants (12.7 billion U.S. dollars in 2017) and more than one third through franchised restaurants (10.1 billion U.S. dollars in 2017). The United States is still McDonald’s single biggest market with eight billion U.S. dollars in revenue in 2017. In 2017, about 37.24 thousand McDonald’s restaurants were in operation worldwide, of which 14,027 were located in the United States. Within the Asia region, China had the second-most McDonald’s behind Japan with 2,391 restaurants in 2016. The other countries with at least a thousand McDonald’s restaurants are Germany (1,470 in 2016 – most in Europe), France (1,419), the United Kingdom (1,274) and Canada (1,450). Overall McDonald’s operated restaurants in more than 100 countries in 2016. The McDonald’s brand is amongst the most valuable brands in the world, valuations vary however depending on the source. Milward Brown Optimor ranks McDonald’s as the most valuable fast food brand in 2018 with a brand value of approximately 126.04 billion U.S. dollars. The main competitors of McDonald’s in the quick-service restaurant market are Subway, Yum Brands! (Kentucky Fried Chicken, Pizza Hut, Taco Bell), Chipotle Mexican Grill, Wendy’s, Burger King, Domino’s Pizza, Papa John’s, Chick-fil-A but also coffeehouse chains such as Starbucks. Limited Service Restaurant - Establishments whose patrons generally order or select items and pay before eating. Food and drink may be consumed on premises, taken out, or delivered to customers' locations.